An art museum is a museum that specializes in works of art ranging from paintings, drawings, sculptures, photographs, and others, which are separated into different smaller spaces called galleries. In a museum, oftentimes the contents of a gallery will contain works that are similar in style, medium, time period, or by artist. An art gallery, if not within a museum, is a smaller space for the exhibition of art, usually visual art. Although primarily concerned with providing a space to show works of visual art, art galleries are sometimes used to host other artistic activities, such as music concerts or poetry readings. Unlike individual collectors, art museums preserve delicate art works with professional preservation techniques and technologies. Curators preserve historical works of art as treasures of humanity. Art museums and galleries collect, exhibit, and offer educational programs to enhance people's appreciation, respect, and understanding of diverse works created during different periods of history and come from diverse cultural backgrounds. For many, works of art are the first experience people have with cultures other than their own. Art museums and galleries are important for building a global community of peace and friendship. Art museums and art galleries are primary institutions that preserve works of art created by numerous individuals from diverse cultural traditions. People often come to understand other cultural traditions through works of art and other artifacts created in other traditions. 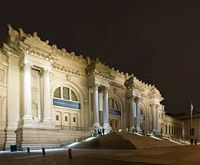 Art museums and galleries collect and exhibit works of art by their artistic merits, regardless of racial, ethnic, national, social, and cultural background of the artist. Art museums and galleries provide a unique space where people can transcend various barriers that divide people. To enhance mutual respect among people in the global community, art museums and galleries play a crucial role. Individuals often encounter other cultural traditions through those exhibitions and programs they offer. Tehran Museum of Contemporary Art is based on some traditional Persian elements such as Badgirs, and yet has a spiraling design reminiscent of Frank Lloyd Wright's Guggenheim. The term is used both for both public galleries, which are museums for the display of a permanent collection of art, and private galleries, which are commercial enterprises for the sale of art. However, both types of gallery may host temporary exhibitions including pieces borrowed from individuals or institutions who own them. The rooms in museums where art is displayed for the public are often referred to as galleries as well, with a room dedicated to Ancient Egyptian art often being called the Egypt Gallery, for example. Also, galleries will often be named after the individuals who donated the art pieces to the gallery space. The term contemporary art gallery refers usually to a privately-owned for-profit commercial gallery. These galleries are often found clustered together in large urban centers. The Chelsea district of New York City, for example, is widely considered to be the center of the contemporary art world. Even smaller towns will be home to at least one gallery, but they may also be found in small communities, and remote areas where artists congregate, i.e. the Taos art colony and St Ives, Cornwall. Contemporary art galleries are usually open to the general public without charge; however, some are semi-private. They usually profit by taking a cut of the art's sales; from 25 to 50 percent is usual. There are also many not-for-profit and art-collective galleries. Some galleries in cities like Tokyo charge the artists a flat rate per day, though this is considered distasteful in some international art markets. Galleries often hang solo shows. Curators often create group shows that say something about a certain theme, trend in art, or group of associated artists. Galleries sometimes choose to represent artists exclusively, giving them the opportunity to show regularly. One idiosyncrasy of contemporary art galleries is their aversion to signing business contracts, although this seems to be changing. A gallery's definition can also include the artist run centre, which often (in North America and Western Europe) operates as a space with a more democratic selection and mentality. An artist-run space also typically has a board of directors and a support staff that select and curate shows by committee, or some kind of similar process to choose art that typically lacks commercial ends. Works on paper, such as drawings and old master prints are usually not chosen by curators to be permanently displayed for conservation reasons. Instead, any collection is held in a print room in the museum. Murals generally remain where they have been painted, although many have been removed to galleries. Various forms of twentieth-century art, such as land art and performance art, also usually exist outside a gallery. Photographic records of these kinds of art are often shown in galleries, however. Most museum and large art galleries own more works than they have room to display. The rest are held in reserve collections, on or off-site. Similar to an art gallery is the sculpture garden (or sculpture park), which presents sculpture in an outdoor space. Sculpture installation has grown in popularity, whereby temporary sculptures are installed in open spaces during events like festivals. The Guggenheim Museum Bilbao in Spain. The late nineteenth century saw a boom in the building of public art galleries in Europe and America, becoming an essential cultural feature of larger cities. More art galleries rose up alongside museums and public libraries as part of the municipal drive for literacy and public education. In the late twentieth century the dry old-fashioned view of art galleries was increasingly replaced with architecturally bold modern art galleries, often seen as international destinations for tourists in their own right. The first example of the architectural landmark art gallery would be the Guggenheim Museum in New York City by Frank Lloyd Wright. More recent outstanding examples include Frank Gehry's Guggenheim Museum Bilbao and Mario Botta redesign of San Francisco Museum of Modern Art. Some critics argue that these galleries are self-defeating, in that their dramatic interior spaces distract the eye from the paintings they are supposed to exhibit. The Museo del Prado in Madrid. Museum Rudana in Ubud, Bali. Interior of Bristol Art Gallery, Bristol, England. The large picture ‘Noah's Ark’ was painted in 1700 by the Dutch artist Jan Griffier. Inside the Hermitage Museum in St. Petersburg. Moscow's Tretyakov Gallery at night. The National Gallery of Victoria in Melbourne, Australia. The front of the Art Gallery of New South Wales in Sydney. High Museum of Art in Atlanta, GA. 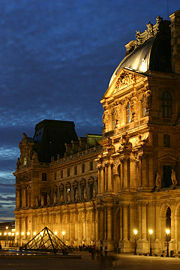 The Mona Lisa Database of French Museums - Joconde (from the French Ministry of Culture) in French. Fine Art Museums of San Francisco, with over 85,000 works. Good for prints. Five College Museums/Historic Deerfield, with over 60,000 works, most with images. 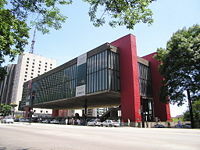 SaoPauloMuseus.com, Museums of São Paulo City - Brazil. There are a number of online art catalogues and galleries that have been developed independently of the support of any individual Museum. Many of these are attempts to develop galleries of artwork that are encyclopedic or historical in focus, while others are commercial efforts to sell the work of contemporary artists. A limited number of such sites have independent importance in the artworld. The large auction houses, such as Sotheby's and Christie's maintain large online databases of art which they have auctioned or are auctioning. The site artnet.com, founded in the late 1990s, hosts an exclusive, fully illustrated database of Fine Art and Design auction lots sold worldwide since 1985. Bridgeman Art Library serves as a central source of reproductions of artwork, with access limited to museums, art dealers and other professionals or professional organizations. ↑ Museum of Fine Arts Retrieved July 27, 2008. ↑ Joconde Retrieved July 27, 2008. ↑ Louvre Retrieved July 27, 2008. ↑ National Gallery of Art Retrieved July 27, 2008. ↑ Harvard Art Museums Retrieved July 27, 2008. ↑ Five College Museums/Historic Deerfield Retrieved July 27, 2008. ↑ SaoPauloMuseus Retrieved July 27, 2008. Anderson, Maxwell Lincoln. "Online Museum Co-Ordination." Museum International. 51, no. 4. 1999. Cargo, Russell A. Art Museum Administration: Bibliography. Washington, D.C.: Museum Reference Center, 1994. Hong Kong Institute of Professional Photographers. Art Gallery. Hong Kong: Hong Kong Institute of Professional Photographers, 2006. Metropolitan Museum of Art, NY, USA. This page was last modified on 15 April 2016, at 16:10.